Come the first of the year, after the champagne bottles are emptied, the Christmas cookies have been eaten, the parties are over, & the hustle & bustle of the holiday season has quieted down, most of us feel like we need to hit the reset button. When our bodies are filled with toxins (“ama” in Ayurveda) we feel heavy, lethargic, achy, & often have a foggy, unclear mind. Making space in your life for gentle detoxification will support the body in lightening this toxic load, giving it a chance to recharge & revitalize. Fortunately, Ayurveda is here to help us rejuvenate & maintain that inner balance. Can balance be found in a bowl of warm & nourishing stew? If made with the loving principals of Ayurveda, I do believe so…. When I learned that VedaWise’s Ayurvedic Winter Cleanse would commence at the beginning of February, I signed up immediately. I’ve done a lot of research, but have never really experimented with an Ayurvedic diet. And if eating the Ayurveda way would help me to feel more balanced, as they say it will, then I am all in. The way I’d been feeling lately, a post holiday winter cleanse seemed like just what I needed! I quickly learned that an Ayurvedic “cleanse” looks a lot different than most cleanses I’m familiar with. It’s not about juicing, or restricting calories, & it’s not considered a “fast,” but rather “a mono-diet” where a simple repetitive menu of nourishing & easily digestible foods are consumed. I will go more into the specifics soon, when I will share “Part 1” of my cleanse experience, but for now I want to tell you about this vibrant soup. For the first 5 days of the detox, our dinner menu consisted of a bowl of seasonal vegetable soup made with an Ayurvedic winter spice blend similar to Garam Masala. While we were provided with optional recipes, I looked to my CSA share for inspiration. This again, is why an Ayurvedic diet works so well for me, as I am already in the habit of eating seasonally. My box contained carrots, cauliflower, beets, kohlrabi, & savoy cabbage – the perfect mix of ingredients to concoct a winter stew. The makings of any Ayurvedic soup starts with warming ghee, adding the spices & giving it a good swirl. Ghee helps the body to better absorb the antioxidants found in these sweet warming spices, & also helps to infuse the flavors. And oh my the aroma! There is nothing more inviting than the smell of an Ayurvedic kitchen. Once the ghee & spices are infused, add in more aromatic wonders – onion, garlic, & ginger. Then finally the vegetables & broth, reserving only the greens to be added in as a final step. I chose kohlrabi greens here as I had them on hand, & they’re wildly nutritious, but any dark leafy winter green will work just fine. ***Just a quick aside, I did make the personal choice to add ghee into my diet for the purpose of this cleanse & will write more about that choice in an upcoming post. In a medium size pot, heat the ghee over medium heat. Add curry powder & mix. Add garlic & onion, stirring frequently for 4-5 minute or until it is a golden color. Add ginger & cook for one minute longer. 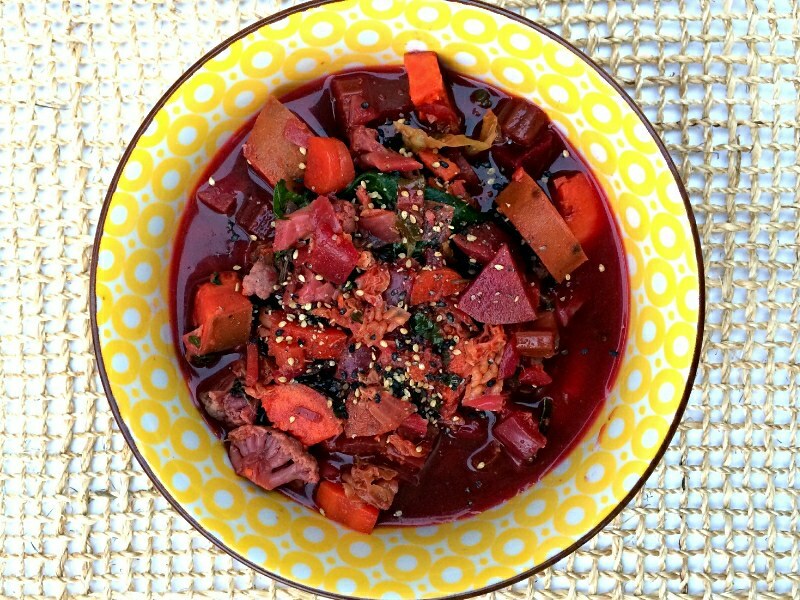 Stir in celery, carrot, beet, sweet potato & cauliflower, & cook for 2-3 minutes. Add 4-5 cups of boiling water, reduce to a simmer, cover & cook for about 15 minutes, until vegetables are tender. Add the greens & simmer for 5 more minutes. Add salt to taste & garnish with chopped cilantro & a sprinkle of gomashio, if desired. 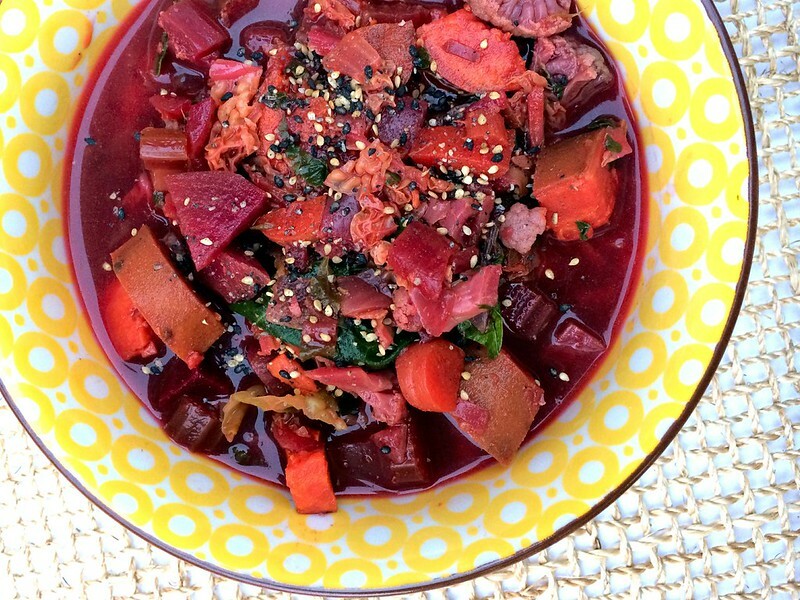 I love how the beets tinted the broth with a precious pink hue! And look at all of those colors – purple, green, orange, red, pink! As they say, eat a rainbow for perfect health. It’s all right here in this bowl. I’ll be back tomorrow to tell you all the about the past 5 days of “cleansing,” share photos of my meals & recipe links, & talk more about the magic that is Ayurveda. This recipe looks absolutely delicious! I’ve been looking for some heart, Ayurvedic dishes and this looks perfect. Can’t wait to try it this week!